Greetings from Kathmandu! I am at the moment awaiting for my Mera Peak group to arrive. My latest Annapurna Basecamp group is right now flying from Delhi to Helsinki. We’ve now done all the Annapurna treks of the season and are flying to Lukla very early on Monday morning. Indian Cyclone brought a lot of snow in the region so I am eager to see how the conditions are. We have plenty of time before our summit-day on Mera Peak so we are not to worry. I’ve been happy spending time with Altitude Junkies people here in Kathmandu! After getting back from Manaslu they are now getting gear ready for Everest next spring! So spring 2014 is South side! Please do contact info@altitudejunkies.com or samuli@samulimansikka.com for enquiries! Mount Everest, South Col 2014. One of the most interesting projects for next year is just to be published on Junkies’ website! After Manaslu expedition in mid-August to early October they are offering a trip to Cholatse! This very beautiful peak is located very close to Mt. Everest and offers really fun climbing! This trip is very, very highly recommended if you want to do some more technical climbing at moderate altitude! Ever wanted to climb Ama Dablam but are concerned of the crowds? Well, here we have the most perfect climb for you! Please look for the Cholatse program here! The upcoming Mera Peak trip is for now the last trip of the season for me here in Nepal! We are offering a trip to Aconcagua in December – January. We already have a group confirmed for Mount Kenya & Kilimanjaro trek starting on Jan 29th! Success-rate on my Kilimanjaro-trips by far exceeds the average. Of my 100 members 97 make it to Uhuru Peak and the rest to either Gilman’s Pt. or Stella Pt. at the crater rim. This is a ’once in a life-time’ trek and I do consider it best to do it the proper way! Find the Mt. Kenya & Kilimanjaro program here! I seem to have reserved quite a bit of time for personal climbs next year! First it’s the European Alps (the best of the best!) in Mid-March and Himalayas in April-May! I have not yet decided and settled on anything but do have a couple projects brewing! Please do follow my climbs and treks on Twitter here! Also check on my SPOT-account to see in near real-time where I am at the moment! I carry the messenger with me on all my guided treks for the members’ friends and families to follow our progress! That’s it for now! Now to the airport! Let the Mera Peak adventure begin! Ps. 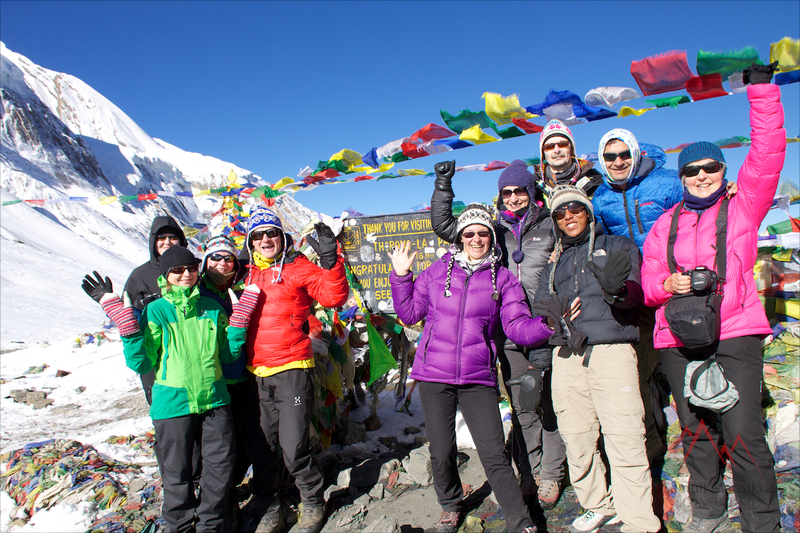 The picture’s from Annapurna Basecamp on Oct 24th! Happy Dashain from Kathmandu! It’s time for the biggest festival of the year and I everytime love seeing the traditions of this massive thing come alive. Kids are flying kites from the rooftops, big bamboo-swings are being assembled, men of the families walking goats down the streets of Kathmandu, women making the final purchasements at the marketplaces.. Season on the biggest peaks is now over. Altitude Junkies returned from another succesful expedition to Manaslu and I’ve been happy to again hear more about climbing this beautiful mountain. See Phil Crampton’s final report here! You might also want to go through one team member’s account on this trip! Altitude Junkies is now already getting things sorted for next spring’s Nepal side Mt. Everest and Lhotse expedition! Please do contact info@altitudejunkies.com or samuli@samulimansikka.com for enquiries! Summitclimb was succesful on Cho Oyu! See the dispatches here! Ama Dablam and Baruntse expeditions have just started and we expect to see summits on both peaks within the following 4 weeks. Find the latest news on Summitclimb website on both Ama Dablam and Baruntse! I myself have just returned from first trek of the season! I took Aventura’s group of 8 wonderful people through Manang walking the route known as Annapurna Circuit. Start of the trip was slightly rainy but improved greatly at around Manang. Above Manang and when crossing the 5416 meters high Thorung-pass we had the most incredible weather with no wind and not a single cloud in the sky! Absolutely beautiful and with such great people! My next group is arriving to Kathmandu tomorrow on Monday 14th! We will then move on to Pokhara and do the 9-day Annapurna Basecamp! After Annapurna BC I will meet the third group of the season to take them up Hinku-valley just East of Khumbu. We will then climb 6476 meters high Mera Peak from where you have incredible views over the Everest massive and it’s surrounding peaks. You still have time join if you now contact Aventura office! Also we still have spots available for what I think might be the most authentic and diverse trek in Nepal at the moment! I will finish the season off with Manaslu Circuit! Here you will find the most incredible nature and outstanding fauna! I was last in the area in November. Saw a huge number of langurs and himalayan thars and also heard of red-panda sightings! This area also holds an unusually strong number of snow-leopards. This truly is a magnificent trek and I strongly advice you to contact Aventura office for this! I am leading an Aconcagua expedition starting late December! This I think is the easiest way of getting as high as possible without climbing-skills. It is the highest trek of the World and you will, however experience high-mountain conditions and feel! It is a full-on expedition on a very big mountain. This is by far the best time of the season and we are offering a high-quality full-service expedition for an incredibly competitive price! Please do get yourself familiar with the program here and contact either Aventura office or samuli@samulimansikka.com. On our website you can follow the progress of all my treks! I always carry a SPOT GPS messenger device to let you know in almost real-time where we are! We also managed to overcome the technical difficulties regarding the Twitter-feed. It is now most convenient for you to follow our trips and daily tweets directly from our website! I hope you found this newsletter helpful and inspirational! Do follow your dreams and experience the World!